And apologies once again. I've been busy - too busy!, unwell, and simply not up to writing. If you've ever experienced a traumatic event, you'll understand what I mean. However, I'm starting to feel a wee bit better, and must say that residing here in Eyeries is helping. In fact, it's so peaceful here that I'm thinking of setting up the Richards Official Sanitorium to offer anyone that needs it a welcoming rest. Now that that's done, I thought I'd best get down to business which is as follows: now that I've managed to almost-settle in this small corner of Ireland, the local committee has informed me that for the first time in 30 years, they've getting with the program by launching the Eyeries Family Festival. 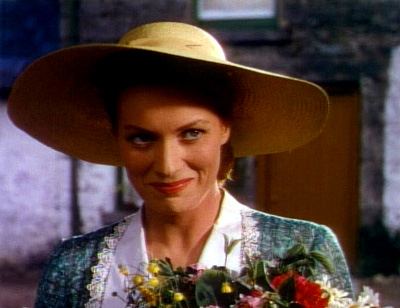 This event, taking place in late July of this year, is chock full of fun for the entire family: from live music on the small streets of the village to a Busquing Competition and - get this - screenings of some of Maureen O'Hara's classic films, including The Quiet Man - made possible by the Maureen O'Hara Classic Film Foundation. So if you don't mind, and if you know anyone that's around these parts in late July, would you spread the word? She Lives Right Up the Road, Didn't Ya Know? I should explain: now 90 years young, Ms O'Hara has retired in Glengarrif, a beautiful small town located about 45 minutes north of here. I've not had the privilege of meeting her yet, but I understand that not only is she able to recall the tiniest detail of her many films, but that she's also a wonderful human being. Now and again - or so I'm told - she ventures out onto the streets of Glengarrif, greeting passerby's as if she's simply another human being - rather than one of the greatest actresses around. Apparently, Ms O'Hara has been retired in these parts for years. I am also told that she has established a Foundation that will promote the arts in the area (as well as her film classics). Shortly, and as funds become available, she is organising the construction of a Foundation Centre. This will not only act as an Arts Centre of some kind, but also provide a location for her extensive archive of costumes and memorabilia, as well as her film collection. I can't wait for it to open in that I must say that she is one of my favorite actresses. So forgive my absence. Oh - and for more information on the Eyeries Summer Festival, please go to www.eyeriesfestival.blogspot.com. Is this leftover from the traumatic events of the housefire and separation? I do hope you are all right! The Festival sounds like it will be good fun. Ms O'Hara is one of my favorites as well... The Quiet Man being a top film for me...as well as Miracle on 34th Street! Maybe she will turn up at your festival. A Sanitorium? It actually sounds quite relaxing... put me down on the list. hey, Tom, it has been a really long time since you have posted. Is everything all right?